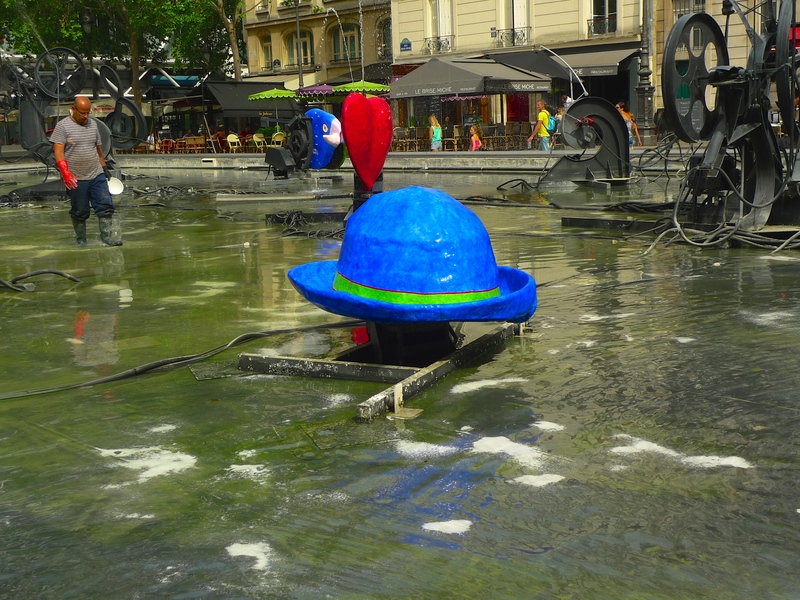 SET IN A SHALLOW basin in Place Stravinsky in the shadow of the Centre Pompidou, sixteen works of sculpture move and spray water into the air. 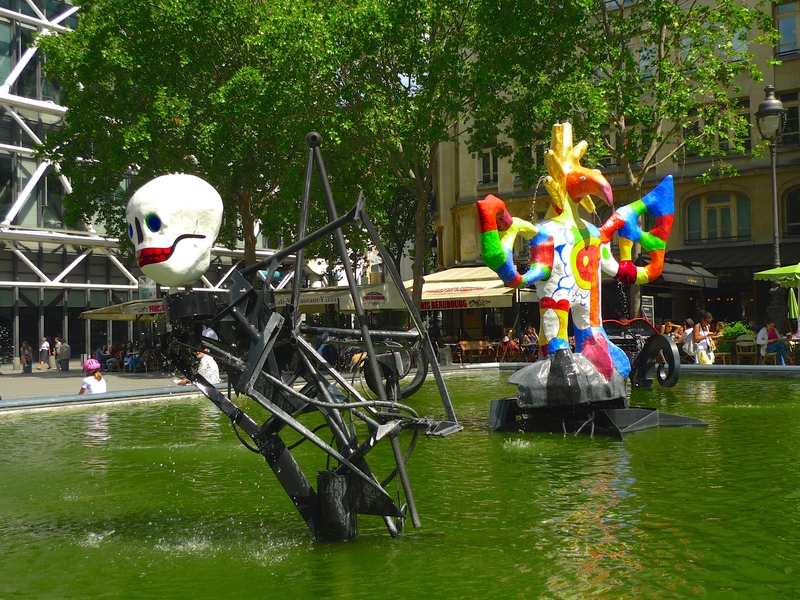 Created by the sculptors Jean Tinguely and Niki de Saint Phalle, these sculptures, collectively known as la Fontaine Stravinsky, form what is perhaps the quirkiest fountain in Paris. La Fontaine Stravinsky was part of a larger sculptural programme, launched by the City of Paris in 1978, to build seven contemporary fountains with sculptures in different squares in the city. As well as la Fontaine Stravinsky, the project included new fountains at the Hotel de Ville and within the gardens of the Palais Royal. 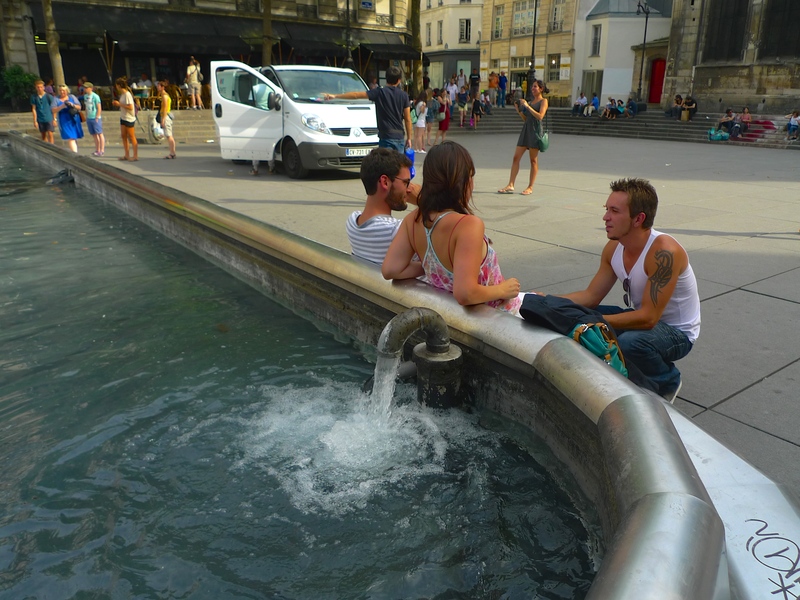 These were the first public fountains to be built in Paris since the fountains of the Palais de Chaillot were constructed for the Paris Exposition of 1937. 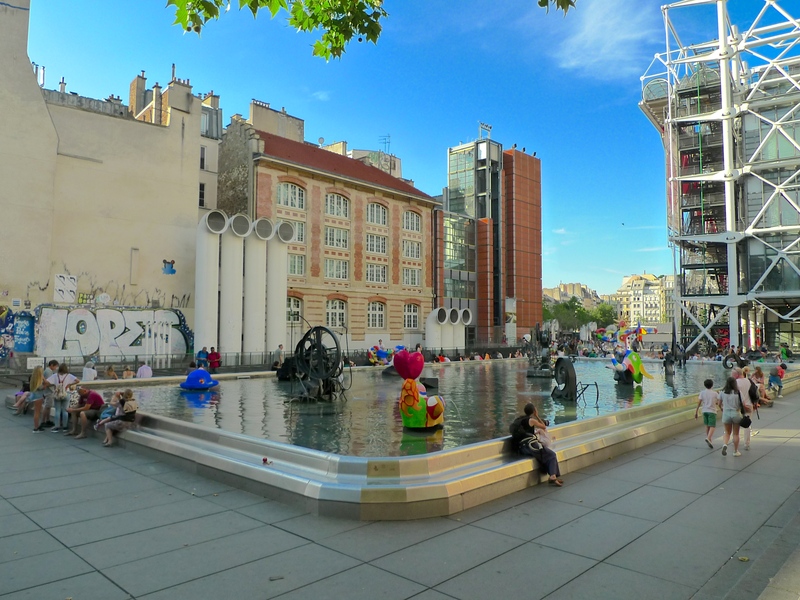 The basin containing the sixteen sculptures sits above the offices of IRCAM, the Institut de recherche et coordination acoustique/musique, an organisation devoted to promoting modern music and musicology. 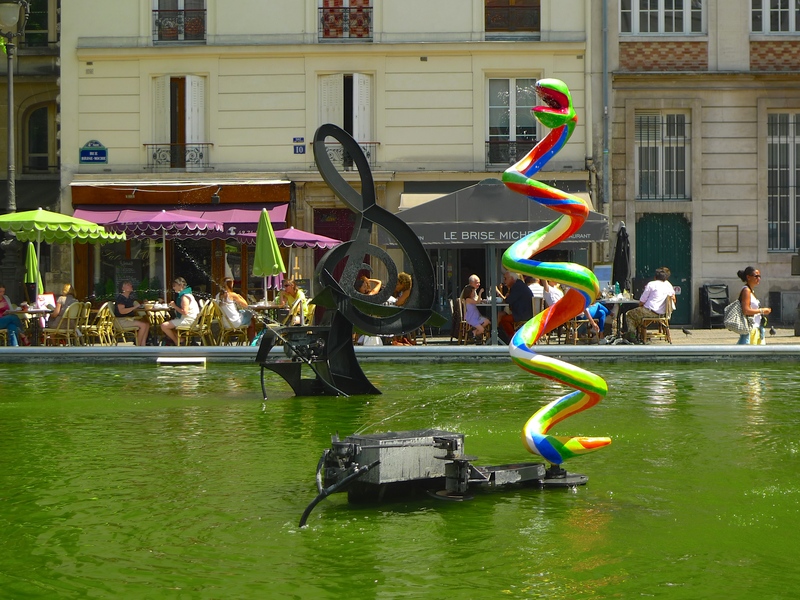 The founder of the IRCAM, the composer and conductor Pierre Boulez, suggested the works of the composer Igor Stravinsky as a theme for the fountain. 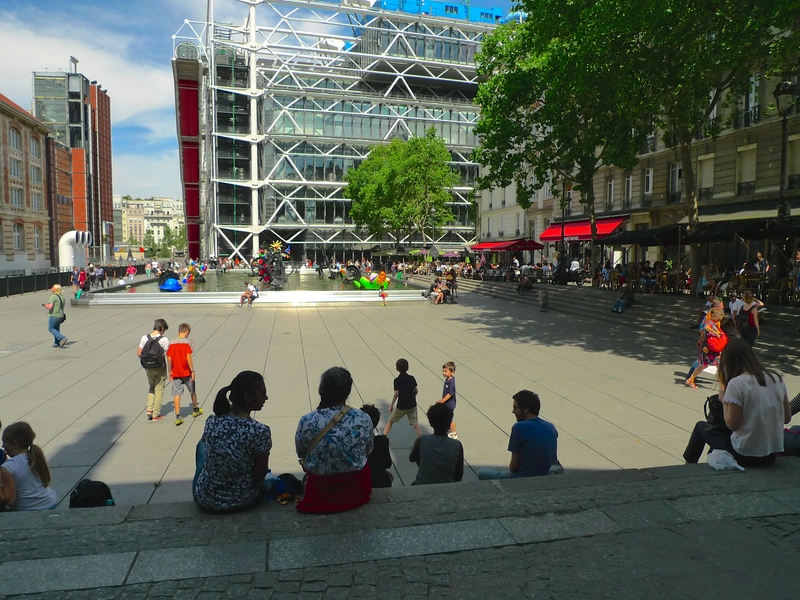 Because of the IRCAM rooms below, the Fontaine Stravinsky was designed to be as light as possible with the basin being very shallow and made from stainless steel and the sculptures made of plastic and other lightweight materials. 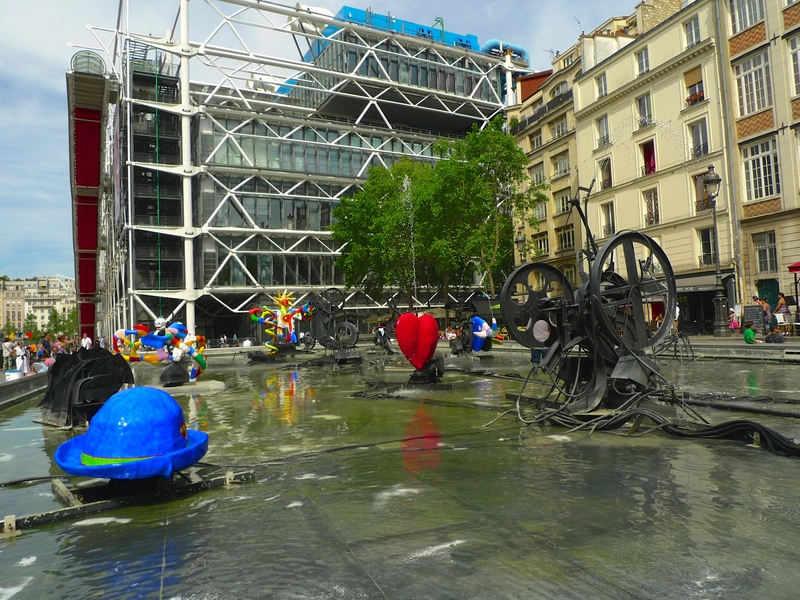 Funding for the Fontaine Stravinsky was provided by the City of Paris who paid two million French francs for the project, which was matched by a further two million French francs from the French Ministry of Culture. 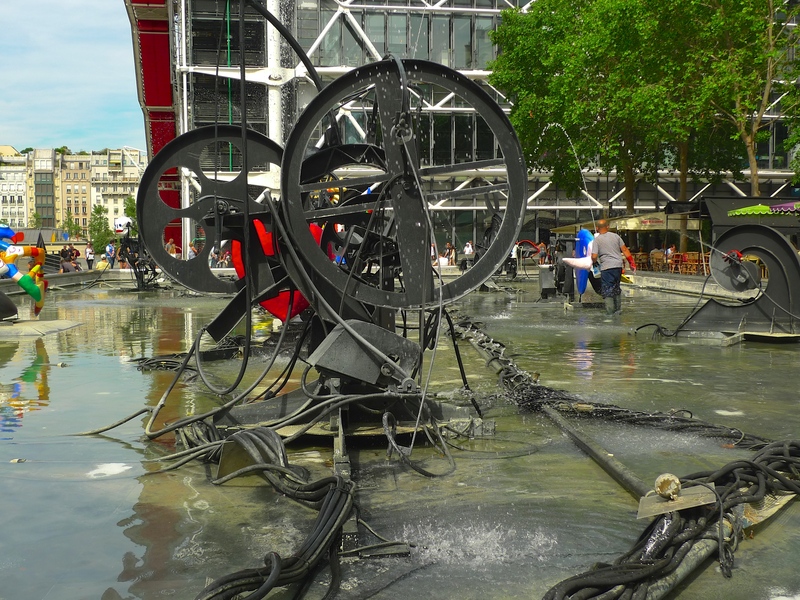 Originally, the commission for the fountain was given to Jean Tinguely, best known for his kinetic art, or sculptural machines. 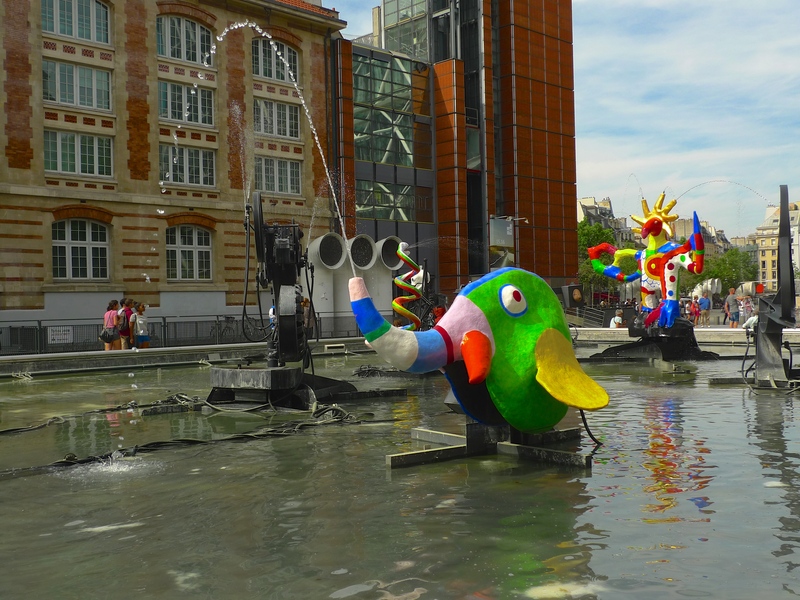 It was envisaged that the fountain would have been entirely composed of his black-painted mechanical sculptures but, in May 1982, Tinguely asked that brightly coloured works by his second wife, Niki de Saint Phalle, also be included. 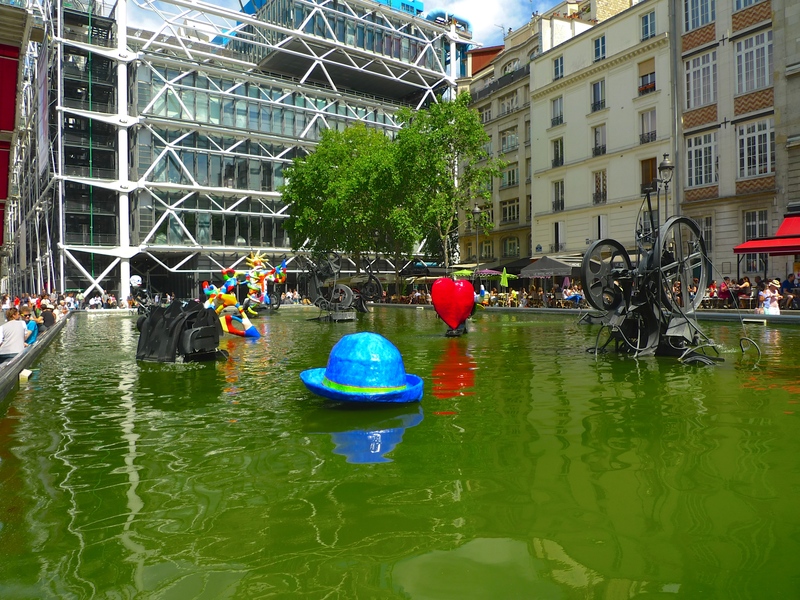 This proposal was resisted at first because it was thought that the brightly coloured works would visually overwhelm the dark works of Tinguely but, after much descussion, it was agreed that it would be a joint project by Tinguely and Saint Phalle. 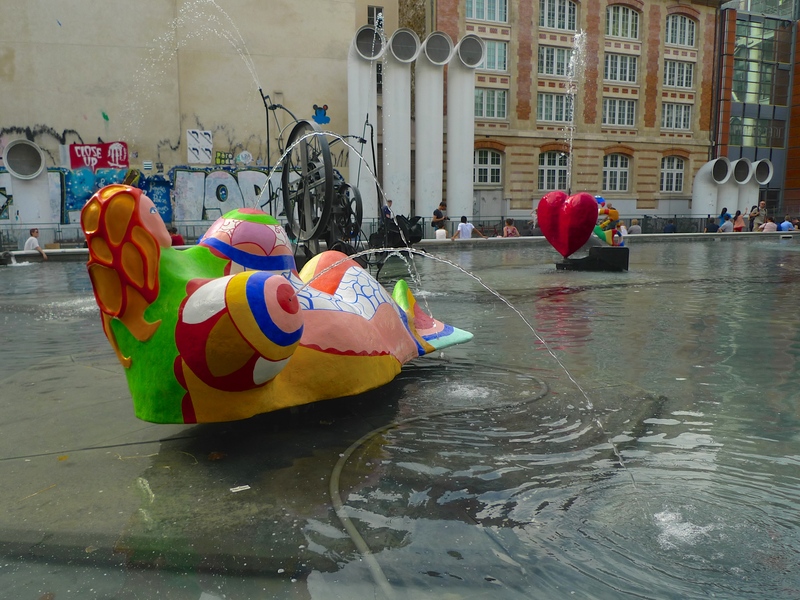 I went to the Fontaine Stravinsky the other day to try to capture the different sound textures from each of the sixteen sculptures but when I arrived I found that the basin had been drained and routine maintenance work was going on. Far from being disappointing, it gave me a chance to see the inner workings of the kinetic art. All sixteen statues move and spray water and the cables and hoses that feed them are laid along the bottom of the basin. There are a host of cafés and restaurants in the thirteenth century rue Brisemiche running alongside Place Stravinsky so I decided to head off for something to eat while the maintenance work was being carried out. When I returned the basin was being refilled and the sculptures were bursting into life. I walked around the perimeter of the fountain pausing to explore the sonic texture of each of the sixteen statues. Some of the textures are quite distinctive but others, the more delicate ones, tend to be overshadowed by their more raucous neighbours – but they are there if you listen very carefully. I recorded in the evening so I was not surprised to capture the sounds of the gentlemen from the Mairie de Paris arriving in their smart, green, electric truck to replace the large translucent rubbish bags beside the fountain. I was though surprised to capture the sound of the water to the fountain being turned off for the night from a stopcock behind the neighbouring Eglise Saint-Merri. The sudden absence of running water seemed to leave a curious sonic vacuum in the air.